On April 22nd, an enhanced martial practice will be held at Earl Thomas Byron of Haverford’s castle, the address of which is listed in the Dark Pages. The primary focus of the day is archery, with a range set up in front of the garage all day and also a shoot from the castle turrets from about 1:00 pm onward. THL Deryk Archer has worked hard to create a set of target challenges for us. The Thrown Weapons and Youth Fighting communities will join us. There will be a space dedicated to A&S, and a few classes will be held. This practice will be held on Sunday, April 22nd in place of the regularly scheduled practice. Come on out this Sunday for Baronial heavy fight practice. Hone your skills, learn new skills, and be ready for Pennsic! We start at 2:00pm at the Washington Boulevard site. There will be fencing practice this Sunday at Washington Blvd. starting at 1:00pm. There will be dance practice at the Washington Blvd practice site tomorrow. Come join in and have some fun. Practice will start immediately after archery practice, around 2:00pm. All dances will be taught and called. No experience necessary, if you can walk you can dance. Looks like the weather is going to clear up for Archery practice. Thunderstorms look to clear up just in time for 11am practice. Weather permitting archery practice is on for this morning. Hope to see you all there. Highland park 11am-2pm. Sunday! Archery practice shall be up and running 11am to 2pm at the usual site at Highland Park. Join us for the usual targets, along with 2 additional targets who dare to tempt our baronial archers. Looking forward to seeing you there! This Sunday… Baronial heavy weapons practice… 2 PM… training, learning, swing some sticks… and melee! Washington Boulevard site. Be there! There will be fencing practice this Sunday starting at 1 PM. Loaner gear will be available. Greetings youth fighters and parents! There will be loaner gear and freezer pops! Sat, May 07, 2016 11 a.m. to 4 p.m. The European Studies Center has graciously requested our present during their festival. 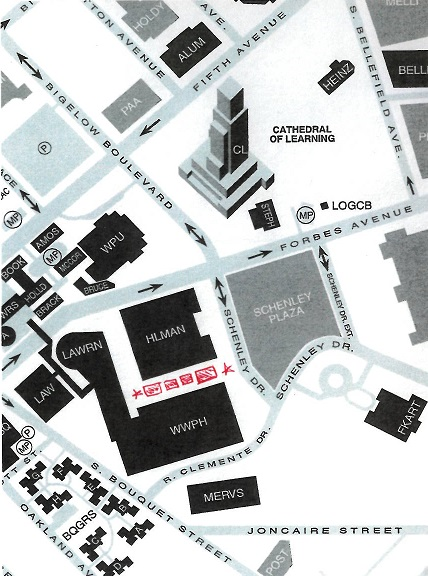 We will be mustering on the grassy area between Posvar Hall and Hillman Library. There will be a BEAR PIT… and pick-up fights! There will be a tent, seating and of course – pickles by request! This is not just for fencers! Bring your crafty things and join us! Contact your chatelaine, Edana the Red, Magnus bastiano de Vigo, or Jorundr hinn Rotinn with inquiries. 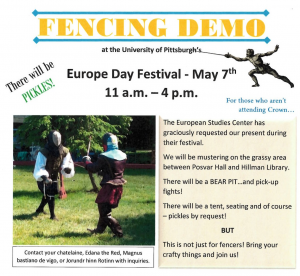 There will also be fencing practice this Sunday starting at 2 at the ECS. As a reminder we will be moving out doors to stay Sunday April 17 unless weather prohibits us, so only 3 more practices at the ECS. location at the Environmental Charter School in Regent Square. If the weather continues to be nice we will be fencing outside. Heavy fight practice will happen this Sunday at the usual winter location, the Environmental Charter School, 829 Milton Ave in Regent Square. Come on out and swing some sticks, and attend the Barony Meeting as well in the same location. Everything kicks off at 2:00. The Baronial Webminister hopes to see everybody there! We will be fencing this Sunday at the ECS from 2-6 as usual. so come on down and stab people. I will have the loaner gear as usual. As a reminder fencing practice will continue as usual this week at the Environmental Charter School starting at 2. Presuming your streets have been plowed and your driveway is shovelled, the marshals assure me that there are Heavy and Fencing practices today at the Environmental Charter School, so please come and practice.